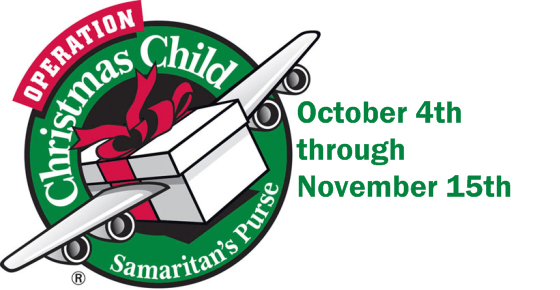 OPERATION CHRISTMAS CHILD will begin Sunday, October 4. Fill a regular or plastic shoebox with needed items to be distributed to children overseas by the Samaritan’s Purse Ministry. You can pick up a brochure, at the church, containing a list of these items and how to pack the box or look online at www.samaritanspurse.org. The boxes will be due back at the church by November 15.